I saw this recipe over at Tasty Kitchen last week. It was a featured recipe and perfect for a very, cold evening. It was simple and easy to make and I paired it with cheesy flatbread. In a large pot, heat the oil over medium heat. Add the garlic and onion. Cook the ontion is softened and the garlic has a turned light gold, about 5 minutes. Add the oregano, broth, tomatoes, salt and pepper. Break the tomatoes up with a spoon. 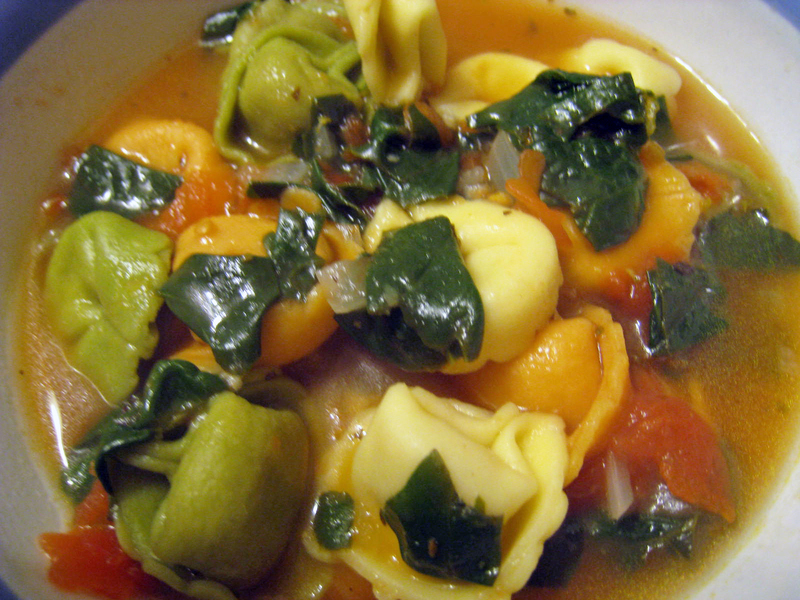 Bring the soup to a boil and add the tortellini. Cook according to the package directions. One minute before the tortellini is cooked, add the spinach. Stir to combine. When the tortellini is completely cooked, remove the pot from the burner to eliminate overcooking. Season with additional salt and pepper if necessary.